The EVO SP (CS) features a charcoal gray finish with G10 grips and straps. The grips are G10 with cool dimples all over. It gives one a firm purchase without being too sharp on the hand. Both the side grips, front and back straps can be swapped for different sizes to fit your hand better. The grips and strap sizes can be changed to fit the volume of your hand. The mag release can be swapped from the left side to right using common tools for left-handed shooters. You change the grips and straps to fit your hands better. You can also swap the magazine release to the right side, and you don’t need a gunsmith to do it. This is the first truly ambidextrous gun from Kimber in this size. 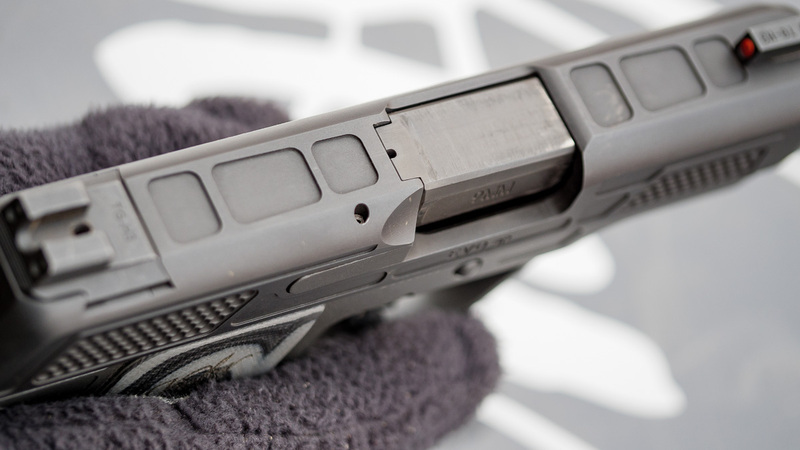 The Custom Shop version features a TruGlo Tritium front sight. The (CS) sights will make you feel like a better shooter. 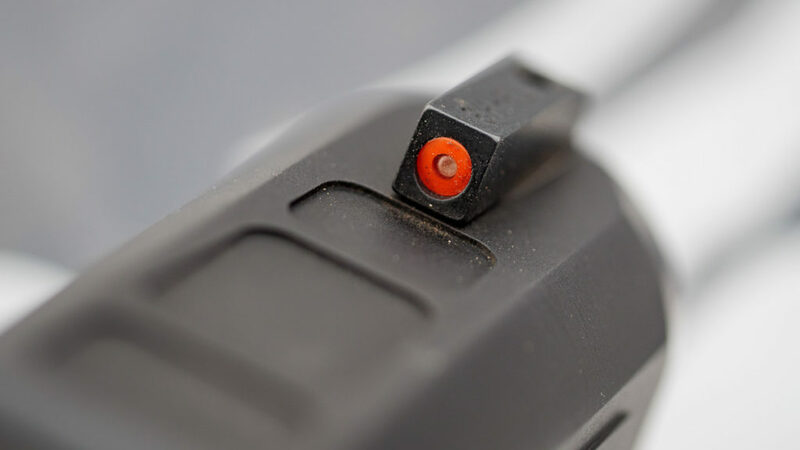 Not only is the bright TruGlo Tritium front sight easy to see, but the U-shaped notch and blacked out rear sights will help you line up on your target more intuitively–round front sight goes in rounded rear sight–pretty simple. 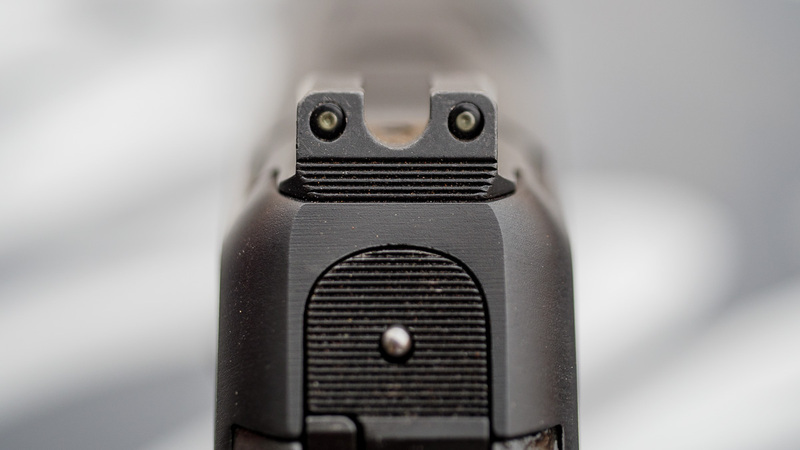 The rear sight has rounded corners to keep it from snagging, too. 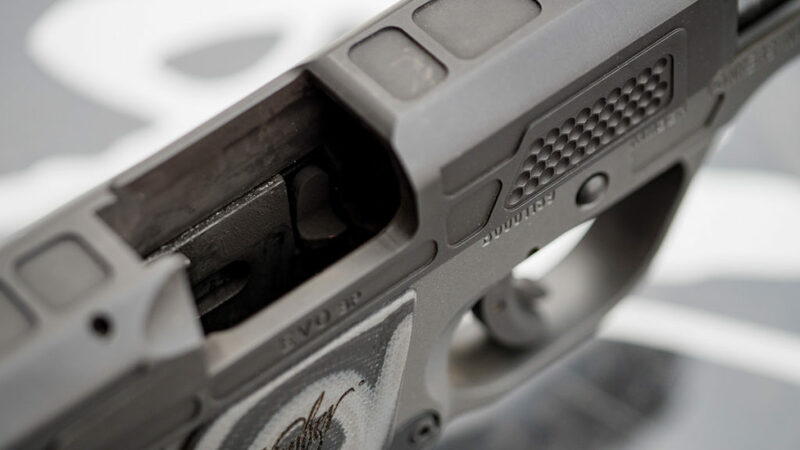 The EVO is striker-fired and features a U-shaped notch and blacked out rear sight. The striker protrudes when it’s ready to fire, and you can feel it with a quick pass of a finger or thumb. Plus, the color contrasts with the slide so when the gun is raised you know immediately if you’re ready to fire. The KimPro Charcoal gray finish looks good on the steel slide. The aluminum frame features the proprietary KimPro II finish while the slide has a highly durable ferritic nitrocarburizing (FNC) finish. It looks good, it lasts well, and it all comes together to give you a good grip on a slide that works smoothly without difficulty. 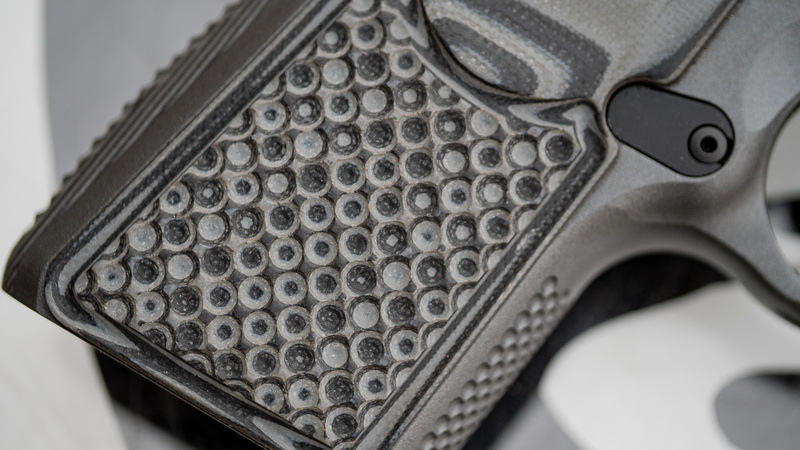 The stippling on the sides of the slide and the scallops on the top not only look good, but also reduce the weight of the steel components and give a good grip for working the slide. 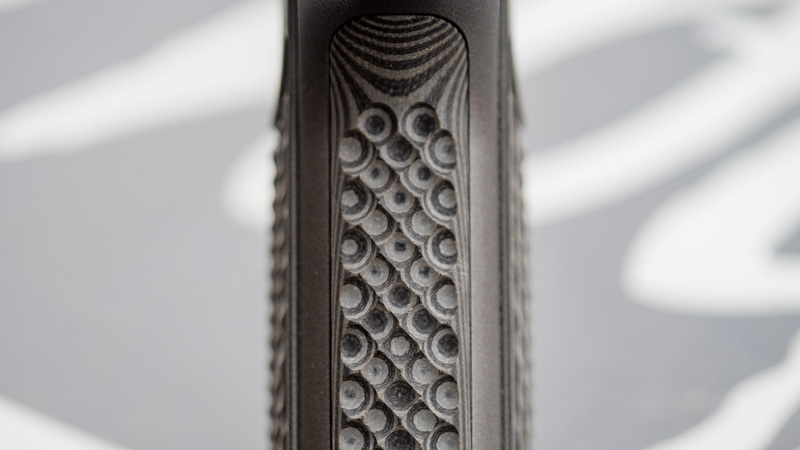 The stylish scallops on the top of the (CS) version and the stippling on the sides also reduce the weight. It comes in at just around 18 ounces. Although it’s lightweight, the aluminum frame gives it the rigidity you’d expect from a larger gun. 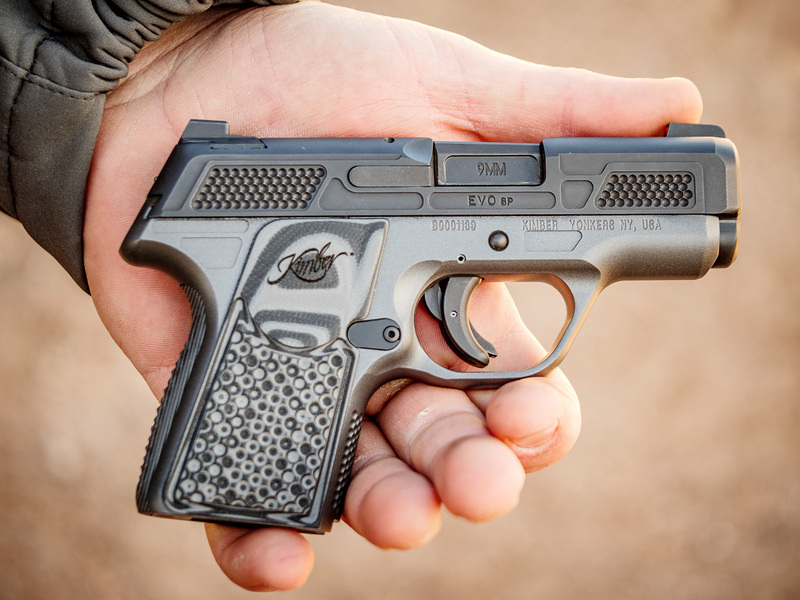 Unlike many micro polymer-framed guns, the EVO is enjoyable to shoot which makes practice fun. It’s available now with an MSRP of $1,047. It shoots great, it feels great, and after my short test at the range, it seems like a terrific carry gun. 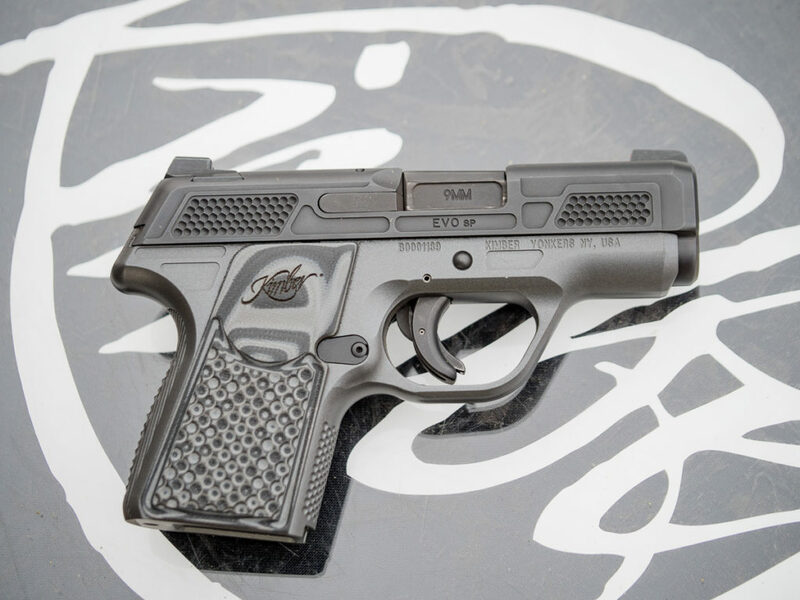 Check out Kimber’s new EVO SP (CS) right here.